We were at Lost Trail Pass , coming out of Montana on Route 93 , back into Idaho and the North Fork of the Salmon River. 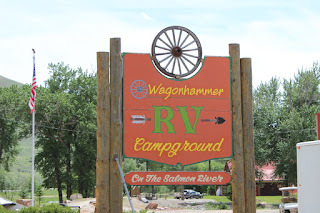 For this stop we find Wagonhammer Campground in North fork, Idaho. 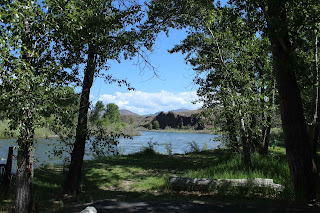 Nice campground and very nice people right on the Salmon River. The hosts and owners are always ready to answer questions and help. Not only that, but they have a great, unusual, and diverse gift shop. So much so, that regular customers return here every year to buy Christmas presents. 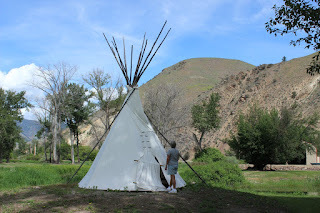 The teepees are very sturdy and usable. Jan is picking up one of many offerings from the cottonwood trees, very common on the banks of western streams, but not something we see out east. 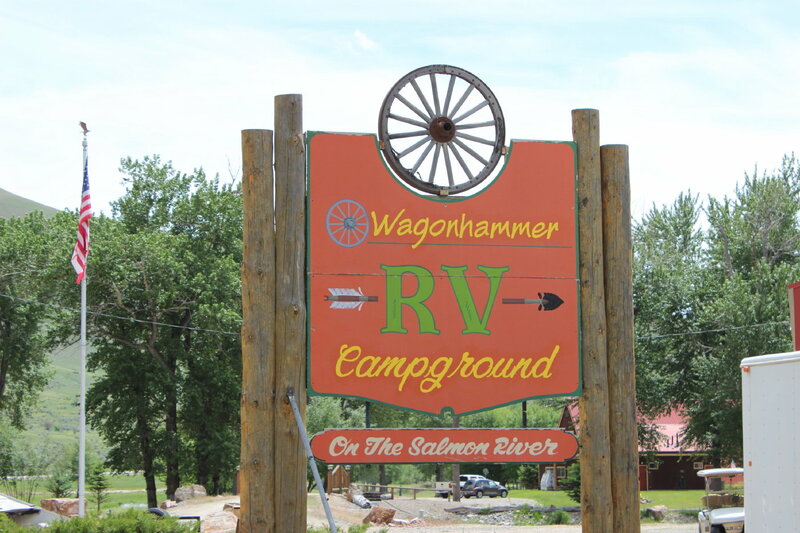 Across the street from Wagonhammer begins this trail with the option of many miles of hiking. Jan and I settled for a few miles. 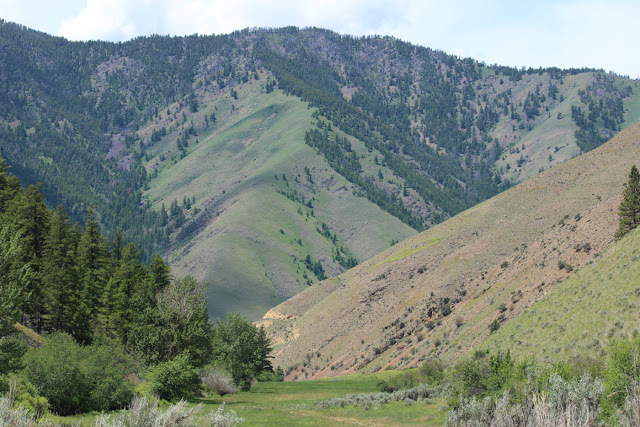 It winds upward through an active cow pasture and eventually crosses the original Lewis and Clark Trail. 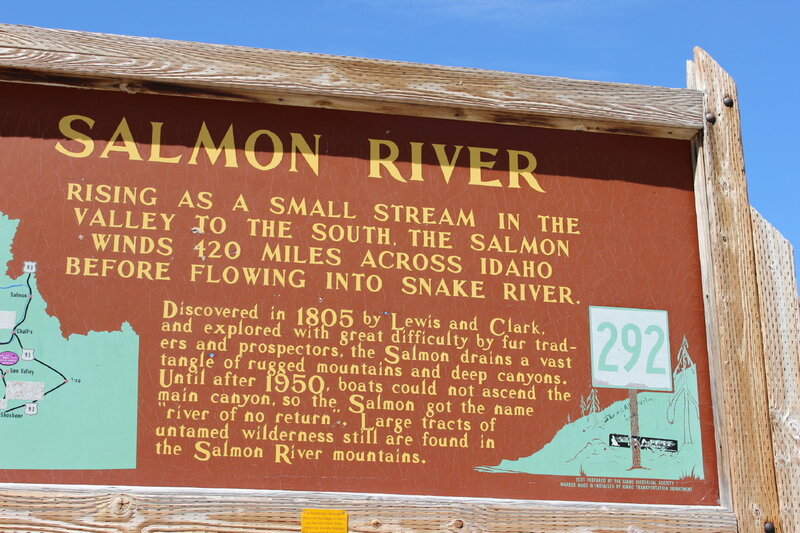 Following Route 93, the next stop is the town of Salmon. A delightful stop with a short but pleasant Main Street. 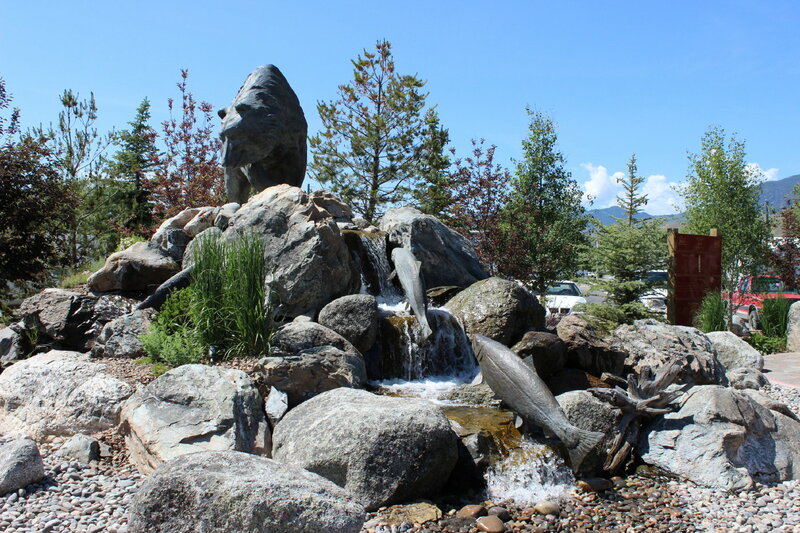 At one end is this fountain representing the salmon swimming upstream and the bear at the top. Also along the way are outdoor clothing and outfitter stores and a most wonderful bakery called Odd Fellows. Some of the best bread and scones ever! Route 93 continues to follow the Salmon River. 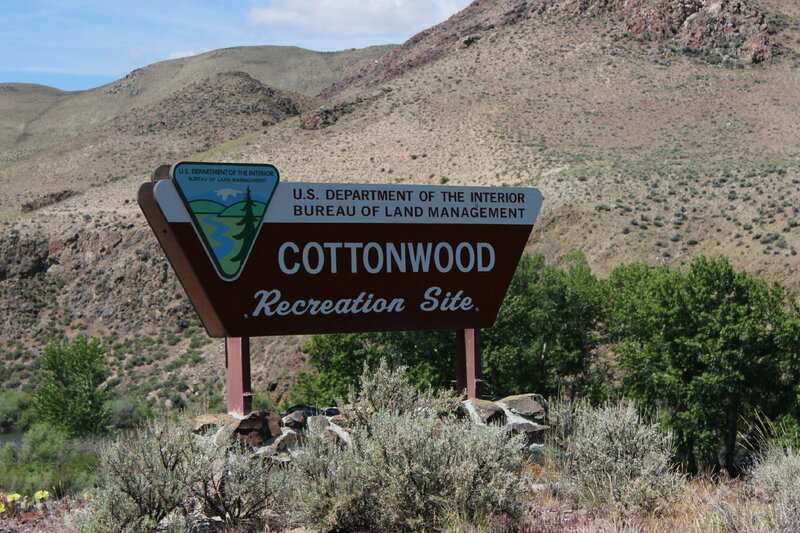 We decide to turn into a Bureau of Land Management campground, Cottonwood. It was not on our computer and smart phone applications, but it looked great from the road. It was also great once we saw the sites. 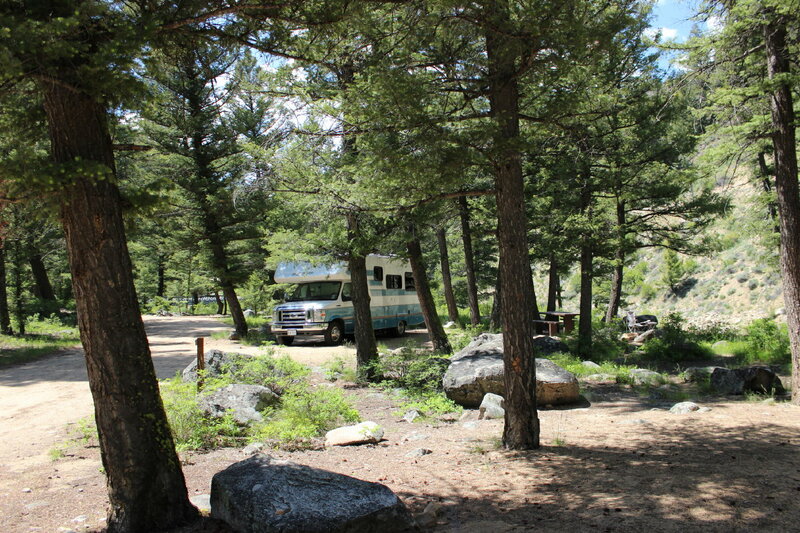 The lower picture is from our campsite and, yes, it also uses the senior pass which meant $5 per night , no hookups. 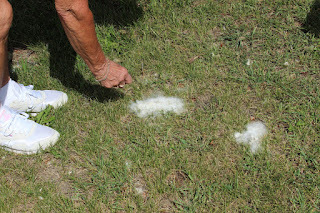 The campground was well maintained with an onsite host. And though there were no hookups, there was a dump station with fresh water. Chinook Salmon, weighing up to 40 pounds and 40 inches long, start their life here on the Salmon River at the the scenic Indian Riffle. They stay here for a year or more and then they start a 900 mile journey to the Pacific Ocean. Along the way they take some time as they near the salt water to adjust their systems to the salt water. Several years later, they reverse the process , taking time to adjust to fresh water, and return here to spawn. Jan and I are not too old to learn(no comments from the peanut gallery). We tried the BLM campground that was not listed anywhere for RVs. 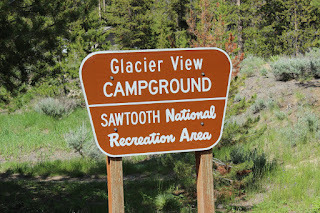 At Challis, Idaho, we leave Route 93 for Route 75, the Sawtooth Scenic Highway. 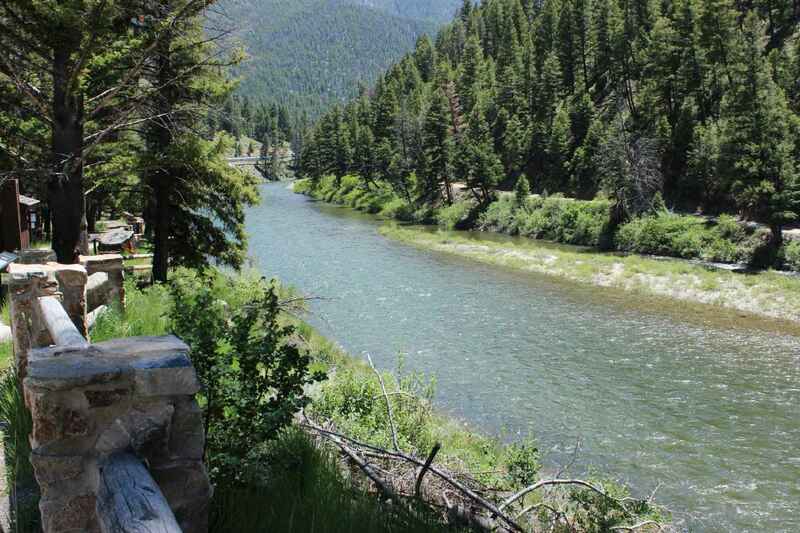 Now, heading further upstream, we see a nice looking campground down across the river. Again, not listed for RVs, and no indication of the road condition. So, we park at the entrance and walk in and across the bridge. All good and sturdy. 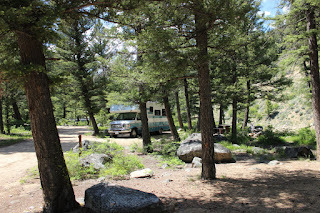 Beautiful campsites! 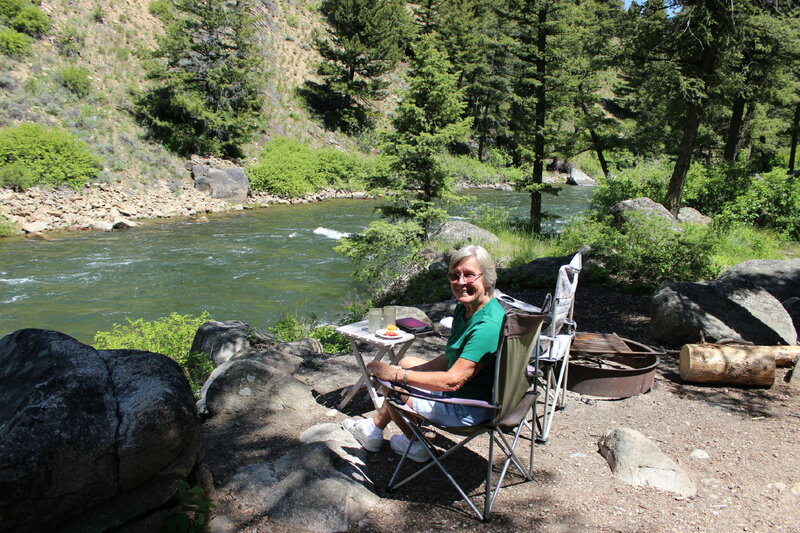 Jan is sitting at our site where we watch rafters and kayakers head downstream. Also get to see an osprey with a fish as big as he is, flying up the river. Anyone thinking of trying this, just remember, no phone, no internet, no satellite,vault toilets,no dump station, and in our case, no other campers or hosts here. You might have it all to yourself! About 15 miles beyond O'Brien is the town of Stanley, population 63. 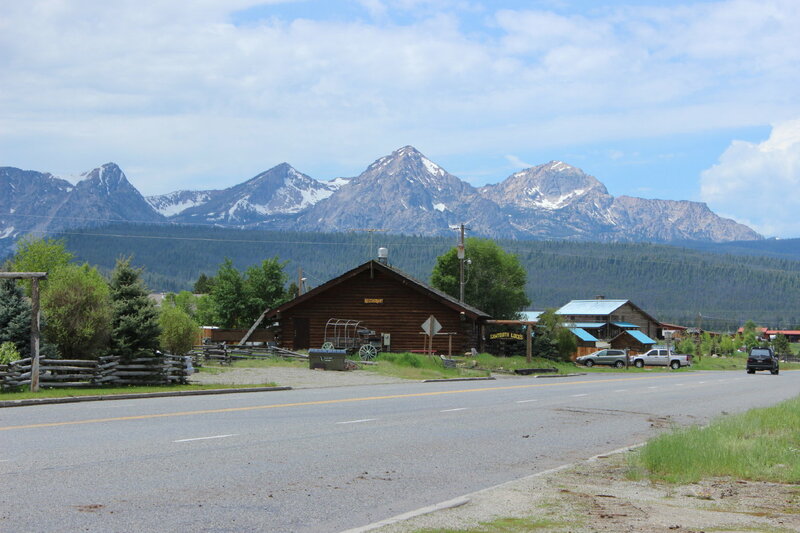 The upper picture is from their main street looking towards the Sawtooth range. The lower picture is a cabin right on the main street that we believe is a rental. 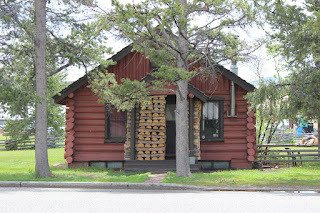 Note the stacked firewood protecting the entrance. 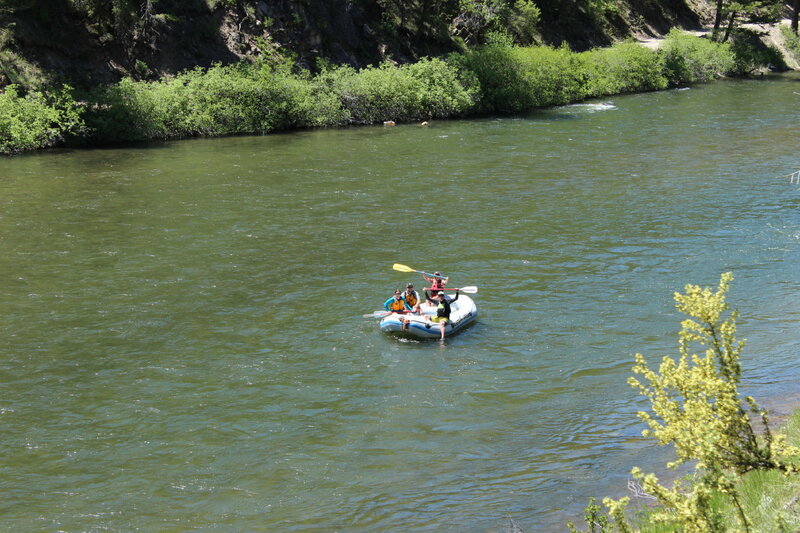 Stanley is a hub for river rafting with a number of companies close by. It is also a center for some serious hiking and wilderness backpacking with miles and miles of trails all over. 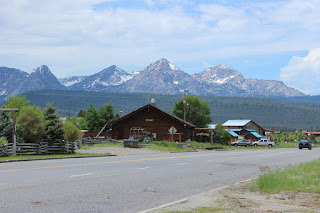 This weekend it is a center for a relay walk,race from Stanley to Ketchum, 61 miles. 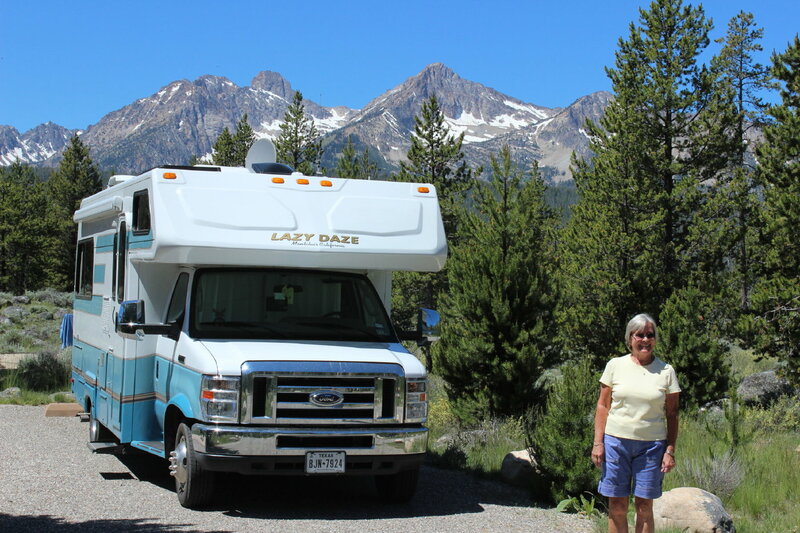 Just a few miles beyond Upper O'Brien is Stanley , Idaho and a few miles beyond Stanley is Redfish Lake which has a number of very popular national forest campgrounds including Glacier View. We are lucky to arrive on a Wednesday. There are a number of open sites to choose from. But, come the weekend every site is booked.. 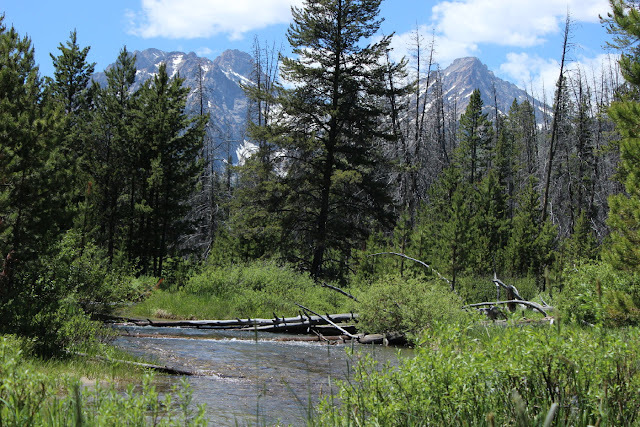 The bottom panorama is of the Sawtooth Mountains from our campground loop. 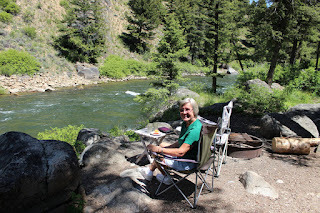 Jan and I really enjoyed this campground. There was a lot to hike and see. The lake was a short walk away. 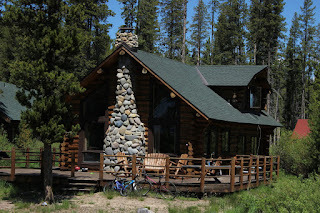 At the lake was the Redfish Lodge which had a restaurant and outdoor food service. They rented boats, had boat tours, and swimming. Nearby was a corral for horseback riding with quite a few horses available. This log cabin is a rental at Redfish Lodge. It also is right at the beach. There are a number of others away from the beach. The lower picture is a panorama from the beach. Hard to see but there are paddle boarders, kayakers, and sailboaters on the lake. 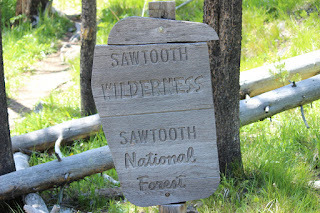 Jan and I took a leisurely four hour hike around part of the lake and then up the Fishhook Creek Trail towards the wilderness trails. Such a beautiful trail, and only one of many. We met some backpackers coming down from a weekend out on the trails. A little over two miles up the trees open up to this meadow at the beginning of the Sawtooth Wilderness. Jan and I agree that this picture does not do justice to the beauty of this view. The weekend came and we wanted to stay in this wonderful area a little longer. 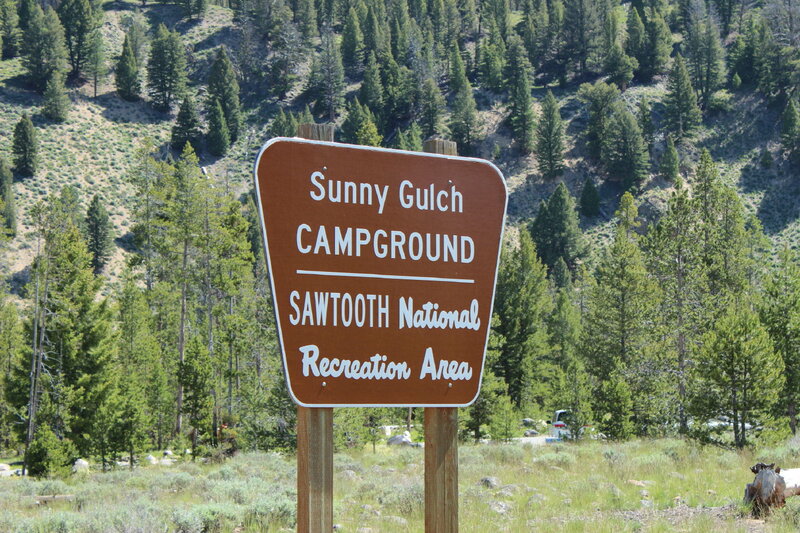 The campgrounds around Redfish Lake are reservable and all full. 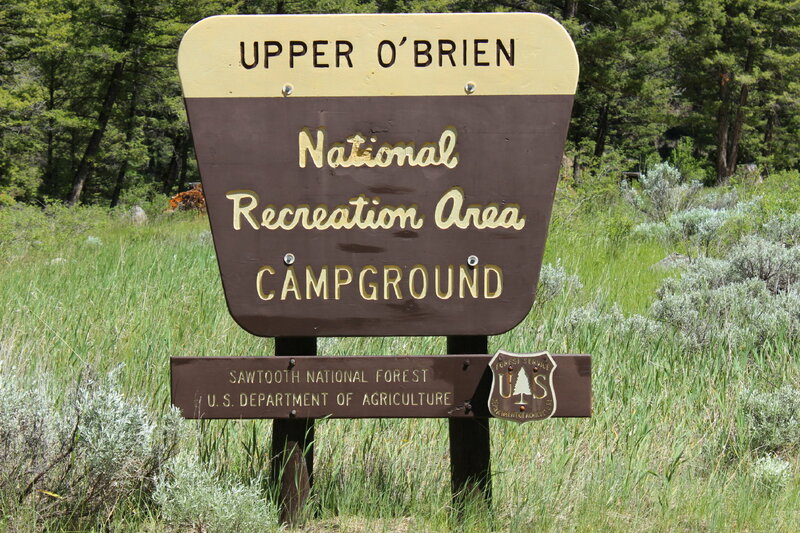 The hosts indicate that these are the top three campgrounds in the national reservation system. 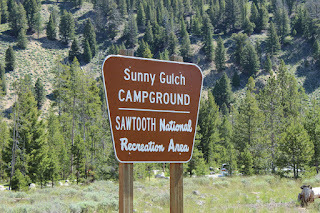 So we head a few miles out to Sunny Gulch which is a nonreservable campground with a lot of open sites. It too will fill up on the weekend due to the Sawtooth Relay Sawtooth Relay. It seems each team has six members and they do the relay in legs. 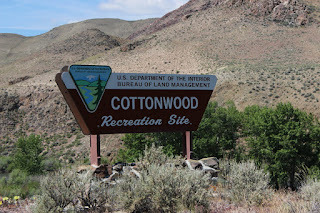 There are 12 legs in the relay and you need to remember that it starts around 6500 foot elevation and one leg climbs about 1300 feet to Galena Pass at around 8700 feet. I would not volunteer for that leg!!!!! As a note, there was a group of sites with the relay that met next to ours. It became obvious that this was a church group. There were about 20 plus with adults and children. They met for meals and singing with four guitar players. They all seemed to have a great time. It reminded us so much of the United Parish group from way back. No, this is not Lady Blue( see above). 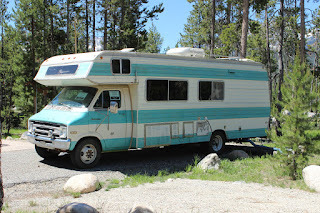 This unit belongs to our campground host. A great guy who chatted with us a number of times. We are adding this picture of his unit to show what is possible for those who wish to fulltime. 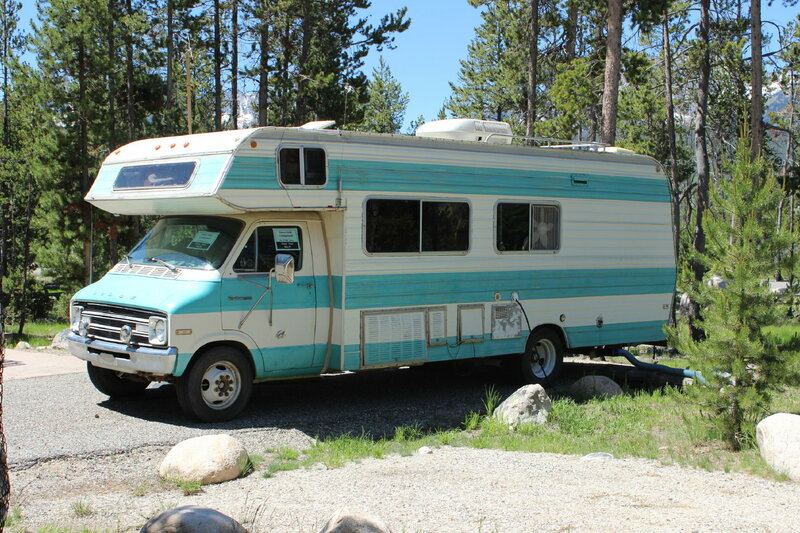 This Dodge motorhome is 40 years old(do you know anything that old????) He indicated that the motor and drivetrain are in excellent shape. Little by little he is adding some solar panels, new, lighter tanks. and some other changes. He paid about $1500 for it. He drives it from Texas to Idaho and in between. 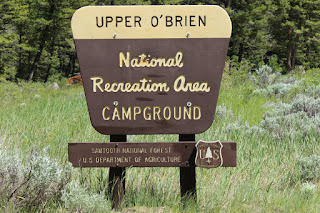 This sign above is close to Galena Pass. Looking back down the valley we can see Route 75 as it heads up here( double click on the picture to enlarge). Also , we can see how the Salmon River begins here as it flows for 425 miles, drains 14,000 square miles, and drops more than 7,000 feet in elevation.It joins the Snake River which joins the Columbia which then flows to the Pacific Ocean. Wow! !